John Lennon described it as a 'dream guitar.' It's easy to see why. I'd like to say that it was early footage of the Beatles, and a monochrome John Lennon with the iconic Jetglo Rickenbacker 325 hanging over his shoulder that made me fall in love with this beautiful guitar. And it's true that it was those images in which it first got my attention. But the moment when I really, truly, fell for it was the day I first put the Bangles' All Over The Place on my turntable. Holding that sleeve, looking at the cover, with Susanna Hoffs sitting cross-legged, Rickenbacker 325 balanced in her lap, and listening to those jangling chords, that's what hooked me. When 16-year old me looked at that photograph, it spoke of a care-free existence where choruses and hooks were conjured up and written down as casually as a shopping list. While glorious, spine-tingling harmonies seemed as natural as speaking. That the songs on the record had echoes of The Byrds, Beach Boys, and Big Star helped too. Manic Monday may have been a huge hit for the Bangles in 1986, but in 1987 when I first listened to All Over The Place, it was Hero Takes a Fall, James, and Dover Beach that stood out. 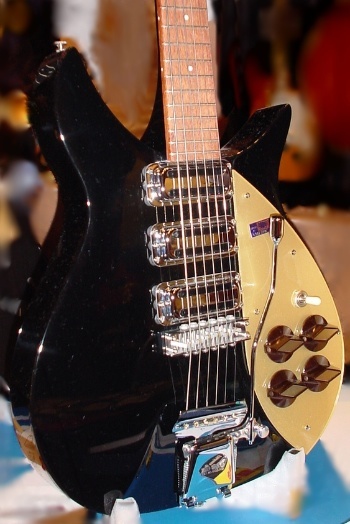 The original Rickenbacker 325, a semi-hollow, short-scale guitar that was all crescent moon curves and swooping detail, had a sound hole. But Lennon's 1958 model was a pre-production model with no sound hole, and while small-scale Rickenbacker 300 series guitars contiuned to have sound holes until the late 70s, subsequent re-issues have capitalised on Lennon's popularity and been made without sound holes. The body and neck are maple, or alder on 50s originals and re-issues. There are three single-coil 'toaster' pick-ups. The trem arm is attached to perhaps my favourite piece of hardware on any guitar, the Accent Vibrato tailpiece. It's not as ornate as the R-shaped tailpiece on other Rickenbackers but there's something solid and industrial about it that contrasts nicely with the curves of the body and the s-shaped trem arm. Sadly, there's only one model available new from Rickenbacker, the 325C64 1964 re-issue, and it's only available in Jetglo. If you want another model, say a 1958 re-issue, you'll have to search for a used model. 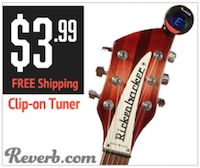 The Rickenbacker 325 is, to our eyes and ears, one of the most beautiful electric guitars ever made. Rickenbacker 1958 re-issue image by CasinoKat. Licensed through Creative Commons.